In March of this year, the innovative online media company Quartz proclaimed that somebody should let Airbnb know that travelers don’t like booking tours and activities online. We at Phocuswright were flattered because they cited our research as a basis for their declaration. There is just one problem. They are wrong. Here’s why. Phocuswright research states that less than 5% of tours and activities were booked via online travel agencies (OTAs) in 2016. Yet the author – and other industry pundits – seem to hold the view that this market is incapable of change. 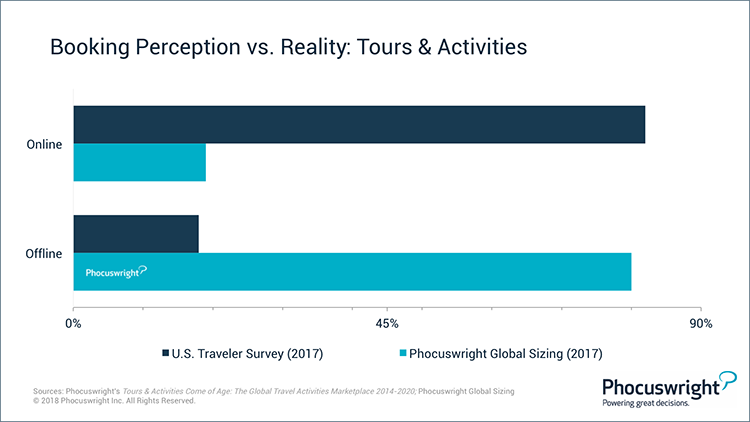 It reminded me of Phocuswright’s prescient work in the vacation rental market some 10 years ago, when we forecast huge growth in online bookings, even though at the time it was all but impossible to book vacation rentals online. The reason: When surveyed in 2008, the majority of travelers (66%) said that they had shopped for their rental online. Why is that significant? Because 10 years ago, travelers were ready to book vacation rentals online, even if the industry wasn’t ready to take those bookings. Well, the rest – as they say – is history. Airbnb is now the fourth-largest OTA by gross bookings and the third-largest seller of accommodations. So what does this have to do with tours and activities? In our annual consumer survey in 2017, we asked travelers how they booked their tours and activities for their last trip. More than four in five said they booked the activity online. That’s a lot more than 5%! However, when I saw those results, I was scratching my head, because I knew from in-depth market sizing work we were doing at that same time, the results were very different. Globally, less than 20% of all tours and activities were booked online last year. The parallel with the vacation rental market a decade ago is uncanny. Travelers are already searching for things to do in-destination. They are ready to book, but the industry isn’t quite there yet. The online booking experience, and the merchandising of the tours and experiences leave much to be desired. But the industry is making headway. More tour and activity operators than ever have adopted modern reservation systems. The big online travel brands have reported significant growth in this segment and continue to invest in technology and a better user experience. GetYourGuide’s plans to roll out its private label tours to establish customer experience standards across the sector is a clear step to leverage brand and confidence when travelers are looking – and booking – online. Travelers are ready to book tours and activities online. Online booking growth will skyrocket. (It’s already growing rapidly – as anyone who speaks to the thousands of amazing operators knows.) It’s time for the industry to catch up – and for Quartz’ excellent reporters to give this industry a chance to change.